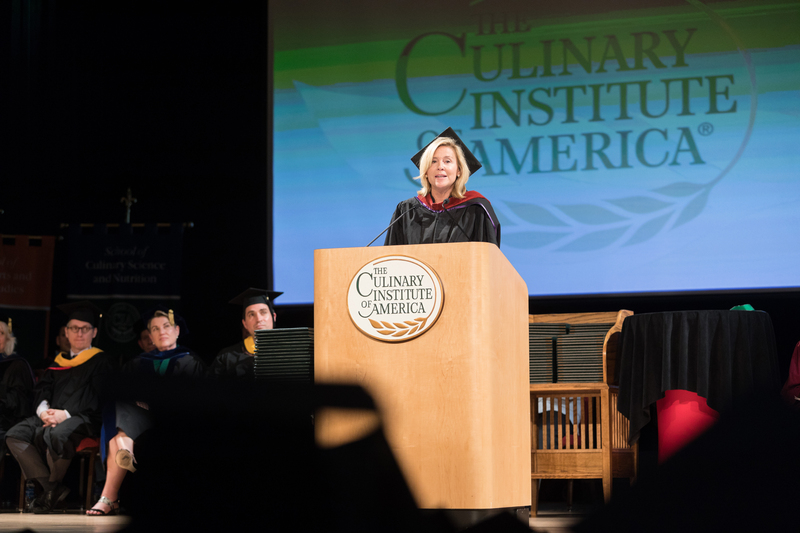 Hyde Park, NY – Anne Fink, president of global foodservice for PepsiCo, delivered the commencement address to bachelor’s degree recipients at the New York campus of The Culinary Institute of America on July 25. Ms. Fink oversees sales, marketing, strategy, and operations for all channels of foodservice—which includes restaurants, workplace, healthcare, lodging, travel and leisure, colleges and universities, schools, foodservice retail, and convenience—both in North America and all over the world. All of this encompasses a portfolio of beverage, snack, and food brands including Pepsi-Cola, Mountain Dew, Lipton Iced Tea, Aquafina, Lay’s, Doritos, Gatorade, Quaker, Tropicana, and many more. Ms. Fink has held several leadership positions in her time with the Purchase, NY-based PepsiCo. She assumed her current title in 2016. Anne Fink serves on the board of the National Restaurant Association and as a trustee of her alma mater, the College of the Holy Cross in Worcester, MA. She is a former board member of the Network of Executive Women, Industry Affairs Council of the Grocery Manufacturers of America, and the Food Marketing Institute Foundation. Ms. Fink is also an executive sponsor for Pinnacle, PepsiCo’s women’s leadership program, and executive sponsor for PepsiCo’s engagement with the Susan G. Komen Greater New York City Race for the Cure. In a separate ceremony the following day, the CIA bestowed associate degrees upon graduates of the college’s School of Culinary Arts and School of Baking & Pastry Arts. The entire CIA bachelor’s commencement ceremony, including Ms. Fink’s address to recipients of degrees in Food Business Management, Culinary Science, and Applied Food Studies, can be seen online. Founded in 1946, The Culinary Institute of America is the world’s premier culinary college. Dedicated to developing leaders in foodservice and hospitality, the independent, not-for-profit CIA offers master’s, bachelor’s, and associate degrees with majors in culinary arts, baking & pastry arts, food business management, hospitality management, culinary science, and applied food studies. The college also offers executive education, certificate programs, and courses for professionals and enthusiasts. Its conferences, leadership initiatives, and consulting services have made the CIA the think tank of the food industry and its worldwide network of nearly 50,000 alumni includes innovators in every area of the food world. The CIA has locations in New York, California, Texas, and Singapore.